Designed for 1 mm pitch, 52.5 x 52.5 mm, 2577-pin BGA ICs, Model SG-BGA-6422 operates at bandwidths up to 27 GHz with less than 1 dB of insertion loss. Unit dissipates up to several watts without extra heat sinking and can handle up to 100 W with custom heat sink. Contact resistance is typically 20 mΩ per pin and current capacity is 2 A per pin. Constructed with shoulder screw and swivel lid, socket is mounted on PCB with no soldering and features temperature range of -35 to +100Â°C. EAGAN, MN -- Ironwood Electronics has recently introduced a new high performance BGA socket for 1mm pitch, 2577 pin BGA IC's. The SG-BGA-6422 socket is designed for IC size - 52.5x52.5mm package size and operates at bandwidths up to 27 GHz with less than 1dB of insertion loss. The sockets are designed to dissipate up to several watts without extra heat sinking and can handle up to 100 watts with custom heat sink. The contact resistance is typically 20 milliohms per pin. The socket connects all pins with 27 GHz bandwidth on all connections. The socket is mounted on the target PCB with no soldering, and uses industry's smallest footprint. The socket is constructed with shoulder screw and swivel lid which incorporates a quick insertion method so that IC's can be changed out quickly. The socket comes with ball guide for the precise alignment of BGA balls to PCB pads. 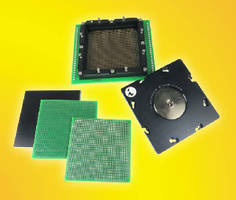 The SG-BGA-6422 socket is constructed with high performance and low inductance elastomer contactor. The temperature range is -35 C to +100 C. The pin self inductance is 0.15 nH and mutual inductance of 0.025 nH. Capacitance to ground is 0.01 pF. Current capacity is 2 amps per pin. Works with IC's such as Xilinx BGA, 52.5mm square package with 51x51 array and 1mm pitch. Pricing for the SG-BGA-6422 is $1805 at qty 1; with reduced pricing available depending on quantity required.